Newcastle Medicals picked up their second win of the season on Saturday and moved off the bottom of the Tyneside Amateur League table. They inflicted a fourth consecutive league defeat on Newcastle East End, who drop to fourth in the table. Liam Walton celebrated a hat-trick for Medics, with John ‘Hartson’ Steel bagging a brace and Neil Freeman completing their tally. Dario de Santos, Stephen Gansore and Dean Bell were on target for East End. The big game at the top of the league saw second placed West Jesmond host North Shields Athletic Reserves, who sat fourth at the start of play. Jesmond had the better of the game, hitting the frame of the goal five times and having two efforts cleared off the line, and they were made to pay as Athletic’s player-manager Leeroy Odd netted the only goal of the game to move his side up to third, only a point adrift of leaders Bedlington Juniors and West Jesmond, with games in hand on both. Lindisfarne Custom Planet Reserves finally won a home game at the sixth time of asking this season with a 3-1 win over Blyth Town Development. Cal Floyd celebrated a pair of goals for the hosts, with Chris Conway joining him on the scoresheet. 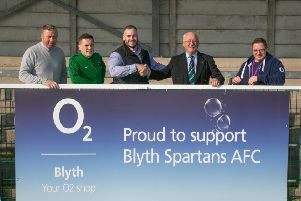 Daniel Burge netted the sole consolation for Blyth. In the other game to beat the weather, Stobswood Welfare and Gosforth Bohemian Reserves shared four goals and the points in Northumberland. Jacob Baker and Luke Phillips netted for Welfare, but Paul Dixon and Matthew Thompson’s counters earned Bohs their share of the spoils.